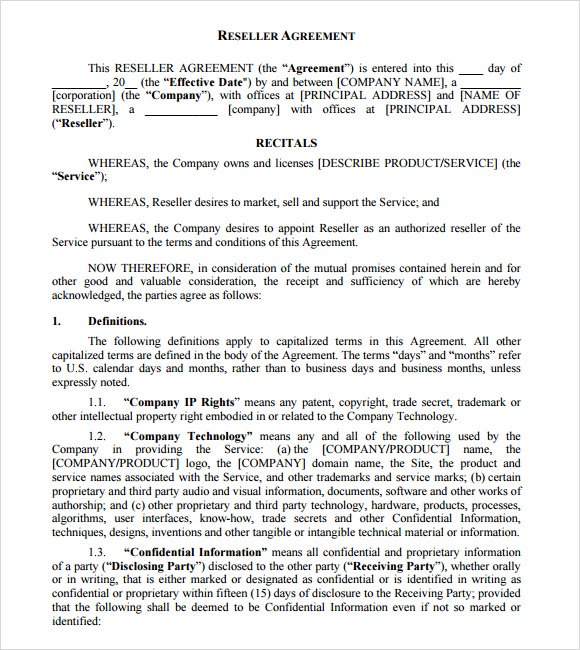 The Sample Reseller Agreements sets forth an agreement between two parties, where one party agrees to sell, market, distribute or lease a product on behalf of the other party. In certain cases, it also depicts a situation where a party buys products or commodities from the other and sells it further adding their own value to it. Examples of such transactions are bulk buying-retail selling, real estate buying-reselling, etc. A reseller can be a company or an individual. As reselling is done for profit, it is necessary to use a suitable sample for the agreement to avoid losses or other problems. To make your work easier, you can download and print our Reseller agreement templates for free. They work across all formats. Available in a PDF format, this template comes in a 16-page file. It is a sample agreement for resellers and the company agreeing to buy it. The entire template is already pre-designed with terms and conditions of the agreement which can be used as an official document after legalizing it. This template is for those resellers who are selling software for business purposes. This template has agreement furnished to protect both the company and the reseller from excessive damage. It is a file of 15 pages available in a PDF format. It is a template best used by resellers and company who are interested in buying and distributing website software. 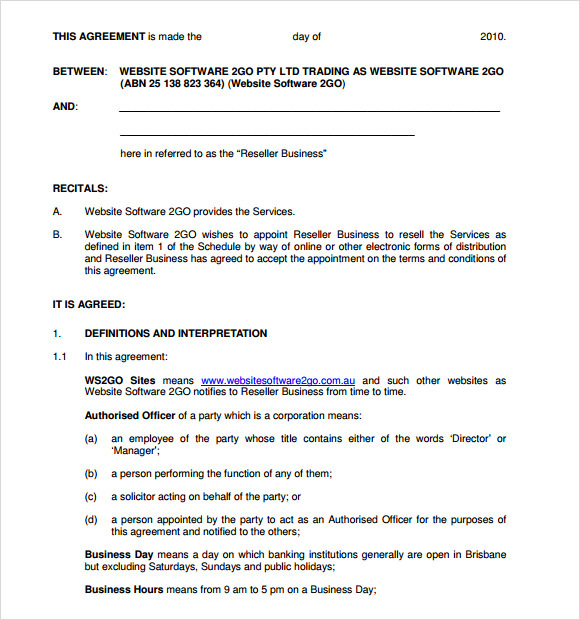 This template has already been updated with clauses of an agreement, only the parties entering the contract need sign in their name officially. 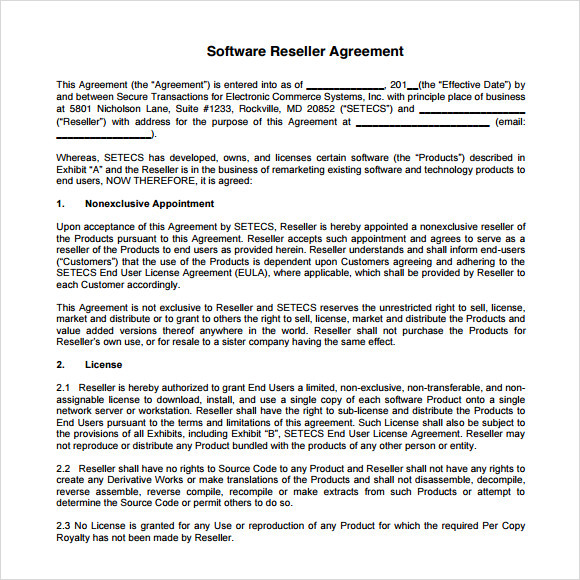 This template is an independent reseller agreement regarding software reselling. The template is available in a PDF format in a 4-page document. The contract talks about the length of the agreement, responsibilities of both the parties and ownership issues. Why Do You Need Sample Reseller Agreement Templates? Thus, the creators contact such distributors and sell their products. To avoid future disputes and legal problems, it is advisable to have the agreement noted down in the fine print, mutually agreed on and signed to acknowledge official consent. This is when reseller agreement templates are handy. When Do You Need Sample Reseller Agreement Templates? 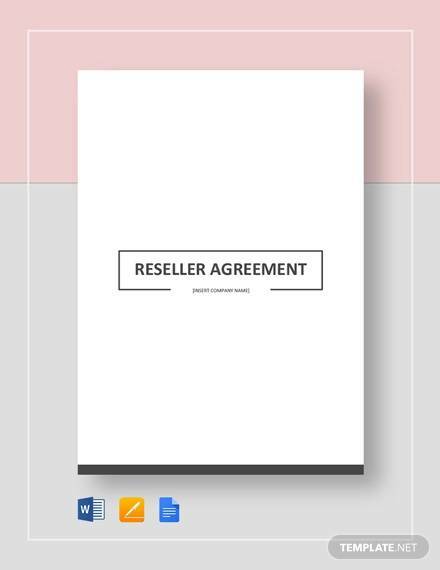 To avoid future hassles and at the same time save money, you can download these Sample Reseller Agreement Templates which are expertly written and can be used for free. 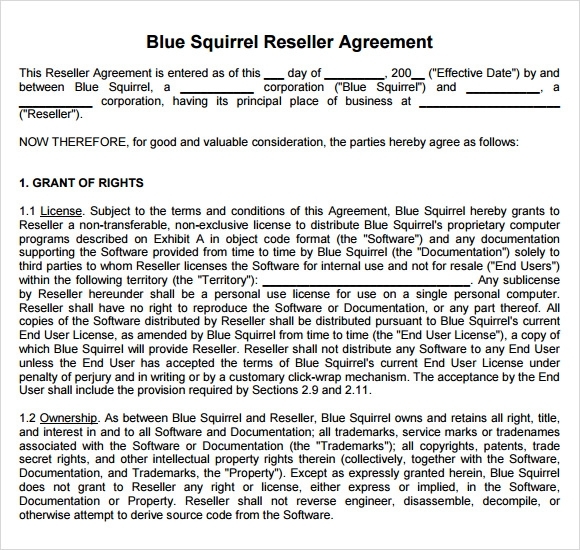 When entering into the reseller agreement, read the document carefully and then sign it. This should be done by both the responsible parties. There are many benefits of using Sample Reseller Agreement Templates. For starters, they are an excellent guide for what to expect and mention in agreements. They can be reused for professional purposes to avoid legal discrepancies in the future. You can easily edit and customize the templates’ content to suit your own requirements and adjust it accordingly. It is available across all platforms and devices. The agreement can be made to be legally binding by competent authorities. 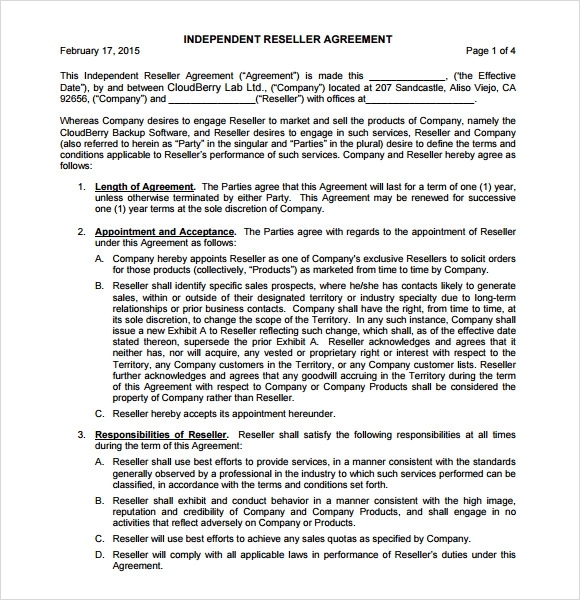 The sample reseller agreement templates can be downloaded for free and printed out for keeping hard copies of the agreement made and signed. 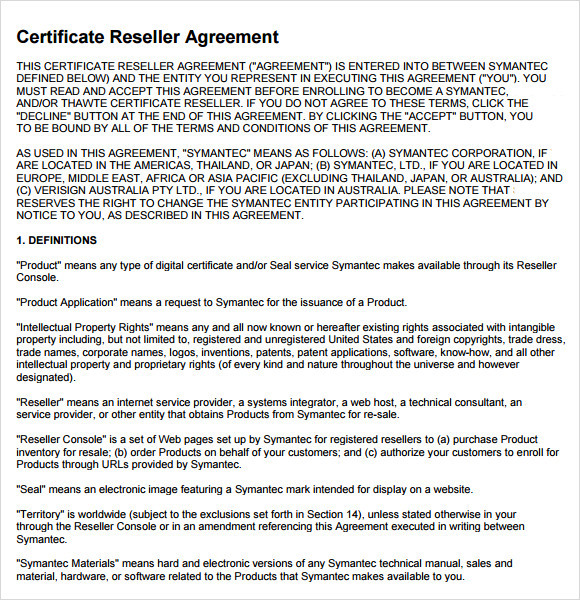 You can avail from our many Sample Reseller Agreement Templates and use it for free. They are expertly written and also operable in any format possible. Having these agreements makes your deal an official one and avoids future hassles regarding numerous issues and disagreements. After all, it is always better to be safe and cautious.